Simply put, a toroid is a doughnut shaped core that has loops of wire wraps along the entire circumference. You will find these components inside electronic devices because they boast multiple benefits over traditional/ordinary coils. A coil (toroidal or otherwise) allows for current flow, but as this happens a magnetic field is created (it surrounds the wire). The looping of wire around the core allows for the magnetic field to be concentrated. The magnetic field that is created acts on the current, and the relationship between the two produces very particular effects. It can smooth out chatter in a power supply as well as increase the voltage of spark plugs in cars. 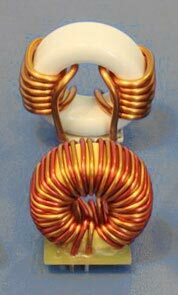 The main distinction between a toroidal core and a regular core is that a toroid can create similar outputs as a linear coil. It can do this will less wire and can be put in smaller places. As a result of less wiring, the toroid has less resistance to DC voltage. A downside of toroids is that they are sustainably harder to wind (this is why professional toroid companies produce the best products). In order to create a strong and proper toroid, most of the wire must pass through the center of the core. This process is difficult to automate (this is because constant pressure must be maintained in order to keep the wire uniform). This requires that toroidal cores be made by hand. This drives up the cost and makes turn around time longer. A linear coil does not require the same winding process, and so it is much easier and cheaper to wind these coils. Wire can be unrolled directly from the spool onto the core. Although there are down sides to creating and using toroids, the benefits outweigh the cons. Besides being smaller and easily mountable, toroids have high shock resistance to vibrations. Once mounted on a circuit board, it will not come lose. This shock absorption is essential for cars, plains, and rockets to work correctly. A toroid is also able to direct the flow of the magnetism. The magnetism is directed inward, and so these devices suffer from very little interference with other circuit components. Getting the proper core for your work/industry will allow to you optimize output (both in terms of quality and quantity). Speak with a local toroid company and find out what cores are best for you.